Have you ever found yourself in that “not really in the mood to go exercise” mood? Perhaps you’re one of those people who need a little extra push every now and then to go get your workout done for the day – I know I am, and that’s why group fitness has quickly become one of my favorite things on the planet. Soon after, I learned that my apprehensive standpoint that held me back from group fitness for so long, and the multitude of questions that raced through my head every time I considered attending a class, were merely figments of my imagination. In January of 2017, I attended my first group fitness class at school, Step Aerobics, and immediately fell in love. I found myself in a highly-motivating environment where everyone in the class, including the instructor, was so welcoming of me, even as a beginner who hardly knew how to follow the steps. There were days where I was exhausted after a long day of classes and studying and could hardly find the motivation to get a workout in, but then I would attend a group fitness class and immediately find myself filled with energy radiating from those in the class with me. I was in group fitness heaven and loving every bit of it, and wishing that I hadn’t held that apprehensive standpoint for so long! Still intrigued by the idea of group fitness, my mom, a long-time Wellness member here at the Cantrell Center, encouraged me to come to a Water Aerobics class with her. I agreed without hesitation, and found it to be just as great and as motivating as the fitness classes I was taking at my school. In fact, I enjoyed it so much, and with the thought of the other classes I’d tried in mind, I decided to take my love for group fitness to the next level: by becoming an instructor! An application was sent to the Cantrell Center, an interview was held, and the rest is history! I’ve been an instructor here for 3 months now, and I truly mean it when I say that I love my job. From my newly acquired perspective of an instructor, I’ve seen even more benefits of group fitness not only in myself, but especially in those who were attending my class. Hearing a member tell me that my class has helped them lose weight or alleviate knee/back pain feels just as rewarding as the feeling I would get when I would attend group fitness classes at school and feel strong and accomplished after completing my workout with those around me. The Cantrell Center has further inspired my love for group fitness, and I hope that it will do the same for you! We offer a variety of group fitness classes, one or all of which are sure to spark your interest. Check out Power Hour, where you’ll go through an hour of circuit training ranging from high to low intensity; Indoor Cycling, where you’ll go for an hour-long bike ride at various intensities (to some pretty awesome music, might I add); Chair and Balance, where you’ll quickly discover that a chair can be used for much more than just sitting down; or Abs Class, where you’ll undergo 30 minutes of exercise circuits that will be sure to target all parts of your core. And of course, you can come find me out in the pool, where we offer classes in the water which include Water Aerobics and Water Walking. In all of these classes, you’ll find highly-motivating, qualified instructors who want to help you succeed and reach your fitness goals. They’ll also give you alternatives and tips during your workout, making these classes suitable for individuals of all ages at all fitness levels. And the best part? You’ll be surrounded by people just like you – people who are goal-oriented, uplifting, optimistic, and ready to get their workout done! Come on over to the Cantrell Center and let us give you that little extra push to get your workout done, and let us have tons of fun while doing so! I’ll see you in class! 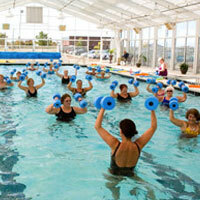 Zayna Al-Husein is a Water Aerobics Instructor at the Cantrell Wellness Center. We receive tons of great feedback each time she teaches a class. Outside of work, she enjoys spending time with her family and friends, playing soccer, and discovering new music. Her mother, Rana, has been a long-time member of the Cantrell Wellness Center– she’s actually the one who introduced Zayna to water aerobics! Her father, Iyad, is a local family physician. Zayna, the oldest of three, has 2 younger brothers: Zaid and Zack. Fun Fact: Zayna is trilingual! In addition to English, she speaks fluent Arabic and an advanced level of Spanish. When asked what she loves most about the Cantrell Center, Zayna responded, “From the moment you walk through the doors of the Cantrell Center, you are immediately surrounded by some of the most uplifting people you will ever meet! From the staff to the members, everyone radiates positive energy. I love hearing members’ success stories and seeing them grow healthier and more confident in themselves as time goes by”.